Lenovo Yoga Tab 3 Review for the 2015 8″ version. Welcome to JaredBodine.com. Today I’ll be giving you a 45 second Lenovo Yoga Tab 3 Review, 8″ version. The Quad-core 1.1Ghz processor and 1Gb of RAM run Android 5.1 (Lollipop) smooth and flawlessly. 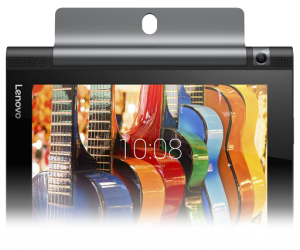 The 8″ screen sports a 1280×800 resolution and supports 10-point multi-touch. The camera is 8 megapixel and rather than have one camera on the front and back, it rotates around. Wireless B/G/N lacks the newer AC standard, but still gets decent range and speed. It also has Bluetooth 4.0. Storage includes 16Gb and offers micro-SD card support, up to 128Gb. For a tablet of this size, the sound is incredible, sporting front facing stereo speakers and Dolby Atmos sound. 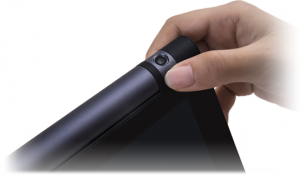 The most unique aspect of this tablet is the integrated kickstand which offers 4 usage modes: Hold, Tilt, stand and Hang, which is unique and can offer creative uses. The star feature of this tablet is the super long battery life, which advertises 20 hours of use and 95 days of standby on a single charge. My personal use confirms those numbers. MSRP: $169, but can be found for cheaper. On a side note, I use mine as master control for my smart home, though use of the Logitech Harmony, Nest and other free apps. Do you have a Yoga Tab? How do you use it? Have you tried the Hang mode? Let me know, or feel free to ask me questions in the comments below. Thank you for viewing my 45 second review of the new Lenovo Yoga Tab 3 review, 8″ on JaredBodine.com, the Tech You Need To Know.